Margot Slattery oversees all Sodexo operations in Ireland and Northern Ireland, where it delivers on-site catering and FM services to clients in IT, business, pharma, industry, education, healthcare and government services. Under her leadership, Sodexo in Ireland has achieved growth of more than 9% year on year in a very competitive market. It now employs 3,700 people, with a turnover of €130 million in 2017. Margot has appeared on the OUTstanding/Financial Times’ list of Top 100 LGBT Business Leaders for the past four years. 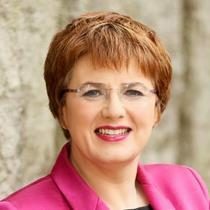 She was FM Leader of the Year at the 2018 Facilities Management Awards Ireland and received a Business Leaders Award at the WXN 25 Most Powerful Women in Ireland Awards 2018. Outside Sodexo, Margot is lead entrepreneur with Going for Growth and holds non-executive board memberships of the Dublin Chamber of Commerce, Sofinsod Insurance DAC and Business in the Community Ireland, among others.